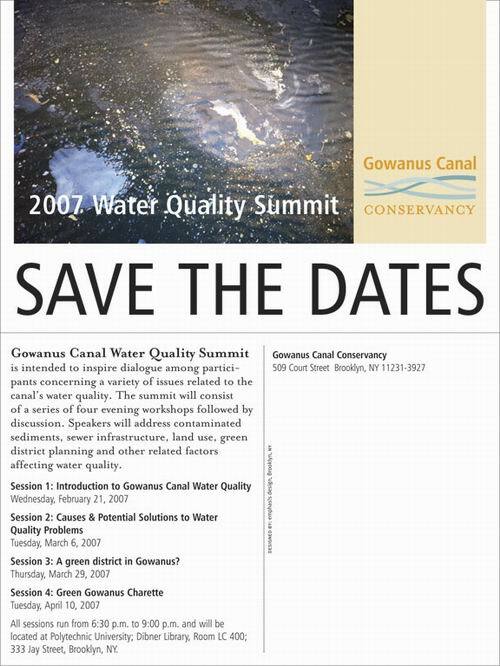 The Gowanus Canal Conservancy, which was formed last year to advocate on behalf of cleaning up the canal and promoting recreational and other uses, is holding a series of meetings starting tonight. The introductory session goes from 6:30 to 9:00 PM tonight. There are other meetings on March 6 to examine cause of water quality problems and possible solutions and on March 29 to look at the idea of a Green District in Gowanus. There's a "Green Gowanus" charette on April 10. All of the sessions take place at 333 Jay Street in the Dibner Library at Polytechnic University, Room LC 400. The Conservancy was formed by the Gowanus Canal Community Development Corporation. This is one Brooklyn organization to which GL wishes productivity and progress.